Part II of Brunch Week... time for some Mexican food at Xochitl in Headhouse Square. If you want to put a little kick into your brunch, Mexican restaurants around Philly offer some great brunches. 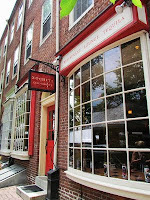 Xochitl is also right across the cobblestones from the Headhouse Square Farmer's Market, so it's an excellent spot to dine before/after you pick up the week's fresh groceries. Brunch is served Sunday 11am - 2pm. 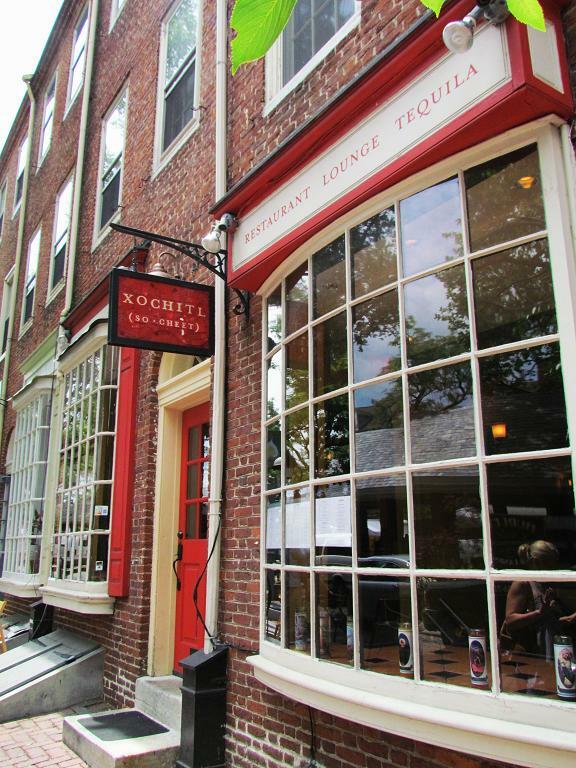 Keep in mind that since I ate there, owners Steve Cook and recent James Beard winner Michael Solomonov (of Zahav fame) decided to sell Xochitl. The staff is supposed to remain but it looks like some additions are coming to the menu. No word on brunch changes yet. Xochitl only launched its brunch menu in May and offered us a complimentary visit to try it out, so I took my trusty food-loving Queen Village Friend (she's made appearances before at spots like Sabrina's and Carman's and will continue to, so henceforth she will be referred to as my QVF). The very nice chef came out and chatted with us but otherwise I think our experience was similar to that of the patrons around us. I already knew the regular margaritas were good from having dinner at Xochitl. This morning I went with a special margarita appropriately named the Chicharito because it was made with a guacamole puree and originally used for shots the night before during a Mexican soccer game. Bradd is also a huge Manchester United fan, where Chicharito is a star player, so I had to try the drink in his honor. I was cool with the day after thing and it seriously did make a good margarita. QVF said the "Bloody Maria" (bloody mary) was quite spicy and on par with other good brunches. 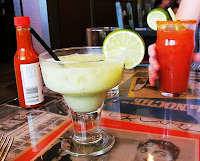 Xochitl also has an interesting brunch beer, the Michelada, made with Dos Equis amber and spicy tomato juice. 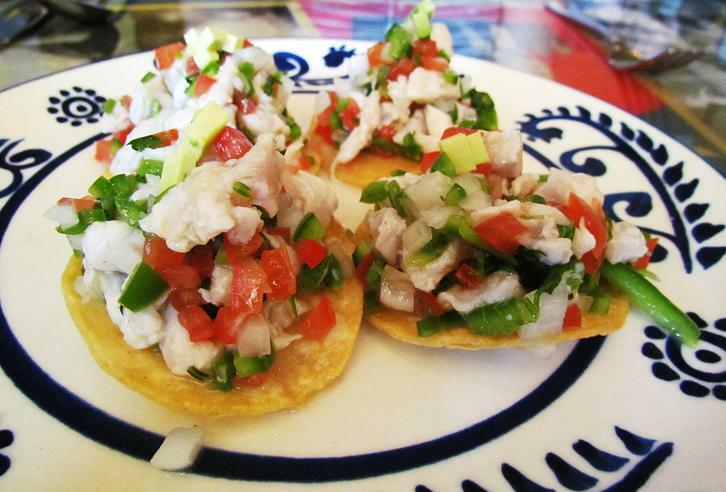 The consensus on a favorite dish was the Tostadas de Ceviche with spanish mackerel and pico de gallo on top of their housemade chips. A cool and light app with just a little kick, they come four on a plate and are a really nice way to start the meal, especially on a hot day. After toying with ordering the Pozole (shredded chicken soup with guajillo broth and hominy) and deciding not to, I was pleasantly surprised to see the waitress offer QVF and I soup anyway as a second starter. We weren't the only ones - I saw at least one other table get it for free too. 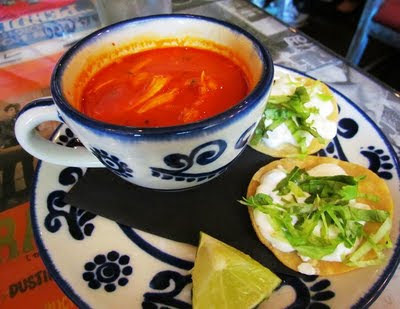 Also a light, small dish, I really enjoyed the soup on its own, and even better after dipping tostadas with lettuce and crema into it. There was just enough shredded chicken to feel like I could eat it all without starting to get full. When it was gone the broth was tasty enough on it's own to steal a few extra slurps. P.S., the tostada chips at Xochitl are really good but many meals come with a few. If you're trying to save room/calories, I'd skip asking for a bowl of chips because you may get some anyway with other dishes. 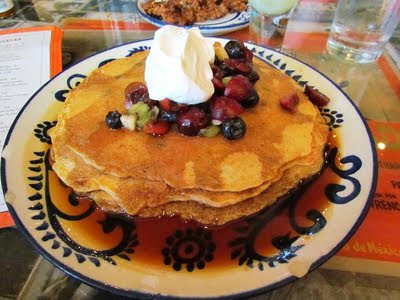 For my main dish, I tried the Hotcakes de Maiz, or cornmeal and black bean pancakes with piloncillo syrup, seasonal fruit and whipped cream. The fruit was very fresh and the crispy outer edges of the pancakes mixed with the sweet syrup were yummy, but overall it wasn't my favorite. It was dryer than typical pancakes because of the corn, and chock full of black beans. I was expecting the beans to be more broken up and swirled in the batter (maybe more like black bean salsa?) but they were just folded in still solid. If you like your beans that way, then you would probably love this. If not, or you aren't a fan of corn tortillas, you might consider something else. salsa de arbol, and queso fresco, served with corn tortillas) but got scared away when the waitress said you really have to like it hot because arbol chili peppers are HOTTT. I'm not that tough and shied away. Slightly regretted that. Maybe I could have asked for a less spicy salsa. 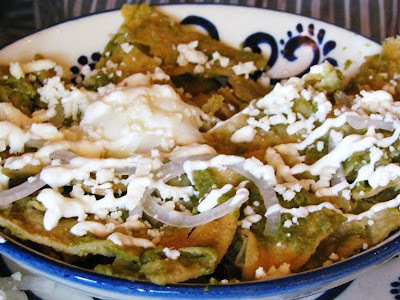 QVF got the Chilaquiles, which combine tortilla chips simmered in salsa verde with slow poached egg, crema and queso fresco. She liked it, but has had better. It only comes with one egg, so you end up eating that fast and get left with just a lot of chips/cream/cheese. I mean YES those items on their own are amazing but as your breakfast, you'll wish there were more eggs. As a side, the Housemade Chorizo was a good choice since there was no meat in our main dishes. I think Xochitl is a solid spot for a Mexican brunch - reasonable on price with some great appetizers and margaritas, but could use a little polishing on the entrees. The other options looked good, as did the guacamole prepared right next to your table. For $18, you can actually get their "el sabor" special of guacamole, choice of entree and one brunch cocktail. We'll see what the new owners do, but hopefully it remains a good spot for those times you want to take the corner diner's eggs and sausage up a notch. Corn + black bean.. and fruit?? I'm so confused. I LOVE corn pancakes but doesn't seem like that would go with a sweet topping.